This is 7 years old Irfan, an exuberant little boy who lives in the slum areas of Madanpur Khadar, New Delhi. Plagued regularly by fatal diseases such as Typhoid and Diarrhea, his story is similar to that of 63.4 million others living without potable water. More than 60 million people in India suffer annually from negative consequences triggered by rainfall during the monsoon season. The precipitation floods various regions of India and pollutes the drinking water of many Indians. 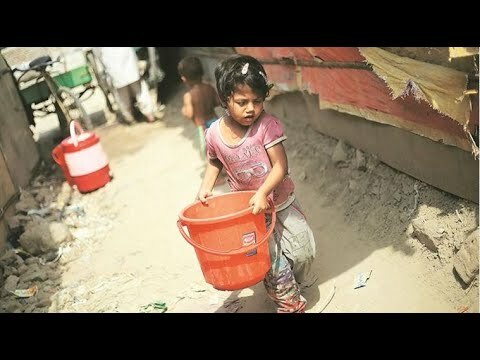 Many of them are denied access to clean drinking water due to high prices or damaged water pipes. For this reason many are forced to drink the polluted groundwater, infecting themselves with bacteria leading to water-borne diseases such as dengue, cholera and diarrhoea. This is where Enactus NSUT decided to step in. Enactus NSUT is a chapter of the international not-for-profit organisation ‘Enactus’, which is a community of student, academic and business leaders, aiming to utilise their social entrepreneurship skills to empower the underprivileged and develop business models that promote the overall growth and progress of the beneficiaries. On seeing the miserable, despairing condition of Irfan we decided to conduct a needs assessment in and around the areas of Madanpur Khadar to discover the deep underlying root problems that plagued this district. Digging deeper we identified a multitude of problems starting from woeful sanitation to open defecation. To our surprise it was ridden with overflowing garbage, completely cut off from clean drinking water followed by erratic supply from the govt. causing frequent fall outs within the community. The only functional water pipeline got mixed with sewage underneath. This is a community, astonishingly unaware of any deleterious effects in its water supply, that simply feels all water is potable if boiled before drinking. None of deadly cholera, dysentery and jaundice causing pathogens vanish sans heat treatment. Seeing the deteriorating condition of our community, Project Drinking Water was born. Sand filters carefully designed to avoid colloidal fouling of RO membranes and better life of cartridge elements. High active membrane surface area. Apart from the aforementioned, we will employ 3-4 people who will work in shifts to look into the working, maintenance and supervision of the filter.They will work in two shifts to distribute the water units to the 250+ families and provide it free of cost to the school. The residents get easy access to clean drinking water at a meagre rate of Rs 4-5 per 20 litres which will eventually translate to better health and increased savings. The revenue generated is utilised in giving away the salary to the employees and reinvesting in the project to scale by deploying multiple filters to cater more families. The project aims to provide clean drinking water at an affordable price alongside promotion of healthy sanitation practices.It also intends to spread awareness regarding good hygiene and sanitation habits through organisation of comprehensive drives and campaigns. 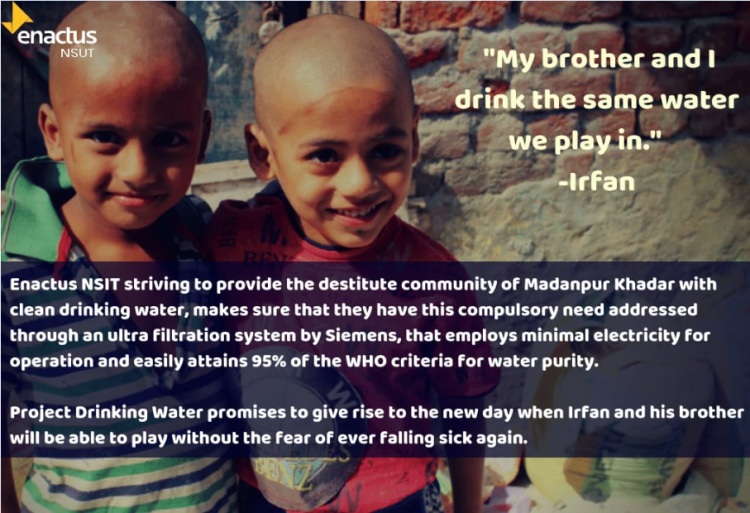 With its far reaching social impact, state of the art technology and an efficient business model.We plan to install our RO filtration system in a school within Madanpur Khadar. Marketing ,expansion and potential future scalability. Running campaigns and awareness drives to ensure holistic growth among our client user base. With future prospects looking very bright, a little financial push is all we require to make all the difference in the lives of the residents of Madanpur Khadar. Every donation will go a long way in helping us reach our goal. Spare a minute, save a life. A little contribution on your part can change someone’s life!